Loyal customers have been feasting on Couple of Chefs\' eclectic menu all over town. Don’t ask the dark blue, ambulance-looking food truck parked in the downtown Spokane area for snack food or a burger sealed in cellophane. They don’t have it and never will. It’s not a “gut truck,” a “roach coach,” or a “silver back” — nicknames for the sort of concession stands you’d find loaded into the back of a pickup. This truck is actually a mobile restaurant and catering business called Couple of Chefs where everything is made to order from scratch. 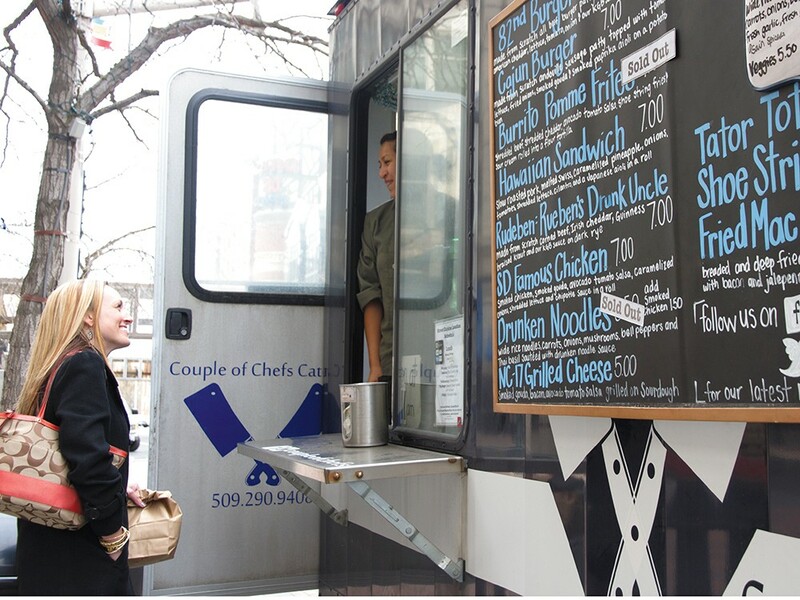 Co-owners Allen Skelton and Joilé (pronounced “joyly”) Forral had the utility truck custom-built as a way of sidestepping exorbitant start-up and overhead costs as they got their eatery off the ground. The truck was fully inspected to meet all state and local health code standards. Both Skelton and Forral, graduates of Le Cordon Bleu culinary institute in Portland, describe their lunch menu as upscale comfort food. Skelton, a Wenatchee native, stressed that they wanted to stay away from deli meats. The Rudeben ($7) — a Reuben’s drunk uncle — is way beyond the common Reuben sandwich. Skelton brines the corned beef himself, then adds more cumin. The sauerkraut is braised in Guinness, and the sandwich has KGB sauce, an amped-up Russian dressing named after the Soviet secret service. The 82nd Burger ($7), named after the 82nd Airborne Division in Fort Bragg, N.C., was done in eight minutes, which Forral, a San Diego transplant, said is the normal wait time. The KGB sauce had a little bang, but was not overpowering. The patty was hand-pounded, and other ingredients (tomato and lettuce) were at peak freshness. On the “going to try it next time” list is the NC-17 ($5). It’s not a content warning, it’s an “adult” sandwich dressed up with items not typical of a plain old grilled cheese. This one has smoked gouda, bacon, avocado and tomato salsa and is grilled on sourdough. They also feature a daily special and cater any genre of food for any occasion.